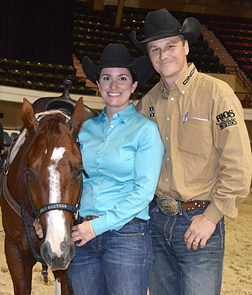 There were lots open of winners at the 2015 Arbuckle Mountain Futurity in Ardmore, Okla, on February 25. But the richest in terms of championships was Beau Galyean, who showed full sisters Magistic Moon and Sweet Metallic, by Metallic Cat. Magistic Moon scored 221 points in the 4-Year-Old Futurity to tie for the win with NCHA Futurity reserve champion Smooth Talkin Style, sired by Smooth As A Cat and shown by Lloyd Cox for Gail Holmes and Hill Ranches. Magistic Moon, is owned by Jimmie Miller Smith, Geary, Okla. The wins were worth $18,750 for each horse. Splitting third and fourth were DMAC Spicy Spoon, shown for Kathleen Moore by James Payne, and Sweet Lil Amanda, with Matt Miller for Chris Brengard; each earned $11,639. Sweet Metallic, owned by Galyean, was one of three horses who tied with 220 points for the 5/6 Classic championship. Co-champion Snap Crackle Cat, by High Brow Cat, was shown by Tatum Rice for John McLaren, McGregor, Tex., and JJs Catless Merada, by Cats Merada, was under Steve Oehlof for Ken Sitton, Freeport, Tex. The trio won a total of $42,148 ($14,049 each). Sannman, by Metallic Cat, and No Way In Hal, by Halreycious, were co-reserve champions with 218 points under Beau Galyean and Lloyd Cox, respectively. Sannman is owned by Alvin and Becky Fults, Amarillo, Tex. ; No Way In Hal is owned by Kathleen Moore, Madill, Okla.
Magistic Moon and Sweet Metallic, bred by Alvin Fults, are both out of Sweet Abra, winner of $117,725, and dam of five NCHA money earners, including Sweet Metallic LTE $93,157; Magistic Moon LTE $50,824; and Magic Metallic LTE $39,486; all sired by Metallic Cat. Previous post link Who’s on first?